Luckner Timothee is a full time farmer and Gaia warrior who stumbled into farming 5 years ago after not knowing a thing about growing anything. Since then he has educated himself in various ways, especially through trial and error and is constantly refining his growing methods. His passion and purpose is about preserving the soil through the right garden practices. 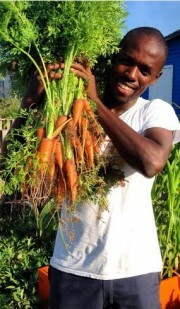 He believes that the Bahamian public needs to become more informed on the possibility of organic gardening to better our local health and economy. He believes that if a totally green (no pun intended) amateur can learn about the soil, native flora and fauna and create a backyard garden, then so can you.